At lunch with my sister and her family this week, our daughter joyfully ordered water when all the other kids were drinking lemonade. I’m so proud of her commitment to this cause and her resolve to fast with a happy heart. We raised $36.50 for Living Water simply by drinking water instead of other things and have already added these savings to our Give Well account! I did choose to break from my fast today (in keeping with the tradition of many who observe Lent) and enjoyed two cups of coffee at church this morning. What a treat a simple cup of coffee can become during a season of self-denial. Gratitude is definitely an outpouring of a Lenten fast, and I was grateful for something besides hot water with lemon and honey this morning! That said, it’s the hot water with lemon and honey (and occasionally, a mint sprig) that has gotten me through the first week of this fast (a suggestion made by several of our readers). 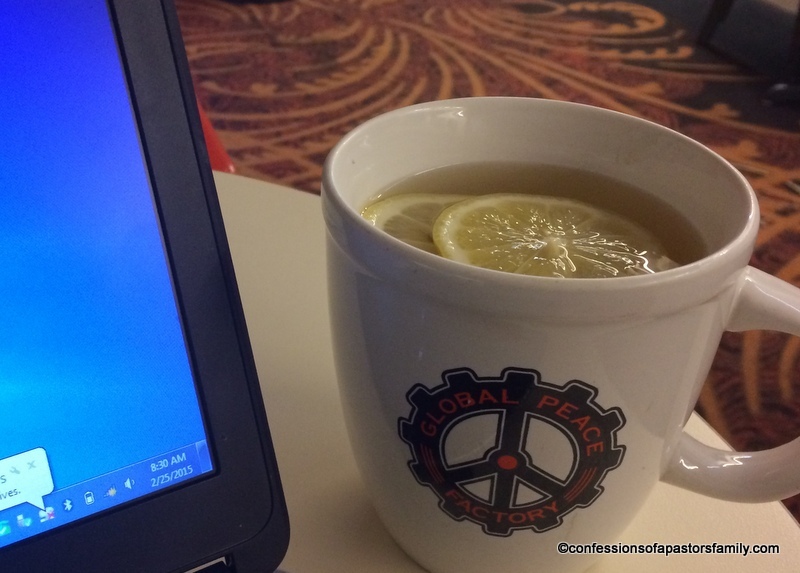 In fact, on Wednesday, I realized I had not so conveniently planned a coffee date with a friend at my very favorite coffee house, Global Peace Factory. When I arrived at the counter, I asked if they could make me a hot water with lemon and honey, and they served me this free of charge! And now I’ll ask for your prayers. For a while now, I’ve wanted to explore the idea of participating in one of Living Water’s short term trips. To travel to another part of the world and help dig a water well for people who don’t have access to clean water. But as I’ve spent time with God each morning during this fast, He’s called me to take some action. So on Friday, I contacted Living Water to begin the process of exploring what this could look like for me, either on my own or as a trip leader with others who want to participate along my side. Would you please pray that I would be open to God’s leading in this regard and that He would make a way financially and logistically for this to occur in His time? I’ll keep you posted as I learn more! “If anyone thirsts, let him come to me and drink. Whoever believes in me, as the Scripture has said, ‘Out of his heart will flow rivers of living water.’” — John 7:37-39. I admire T so much for participating in this sacrifice and being true to it, even when it’s not easy. I also just love how you are “reinvesting” your beverage expenses into the live well campaign. Keep going! Goal is so close now. Yes! We’re only $226 away from hitting our Advent goal, and I haven’t deposited last week’s funds yet! I can tell you that on Easter, though, I will be making an Eatzi’s run!